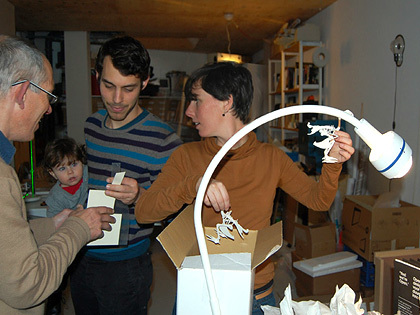 This project by Belgium design studio Unfold offers a new model for the distribution of digital manufacturing to include local small workshop units that can be globally connected. I was invited to participate as an example of how small producers could be linked. I have written further on this project under collaborations here. 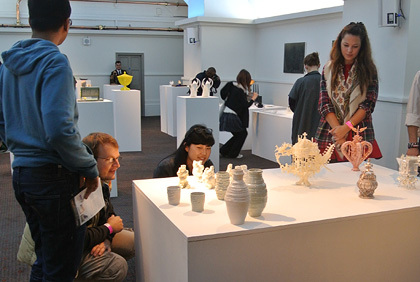 As part of the London 3D PrintShow that focused more on domestic 3D printing an exhibition of invited artist was staged to show what creative's are doing with the technology. The work on display varied in quality and intention but made for and interesting addition to the whole show and generated a lot of press. After the talk I gave in January at the V&A Flemming Tvede Hansen who teaches at The Royal Danish Academy of Fine Arts, Architecture, Design and Conservation approach me to setup a RapMan 3D printer similar to what I am using for the School of Design. During the summer the printer from UK based company Bit from Bytes was delivered to me and I put the kit together, made the necessary conversion to print with clay and ensured it was working properly. Then at the beginning of September I flew to Copenhagen with the printer parley disassembled in my luggage. 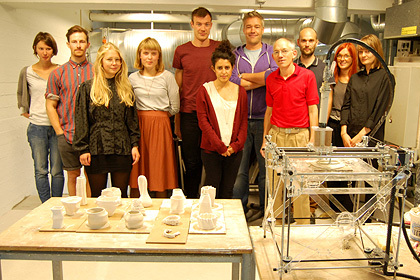 The printer was needed for a course offered to students across the Design School and is linked with a German Ceramic factory to explore the possibilities of 3D printing in the ceramic industry. 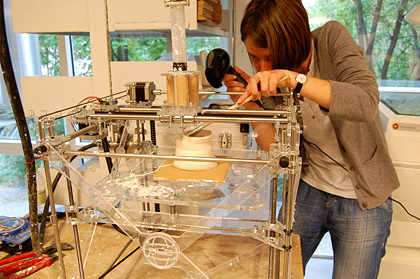 The aim of the course is to be very open, explorative and experimental so the DIY RapMan printer is ideal for this. My part was to spend the first week with the students to set up the printer and get them all printing. 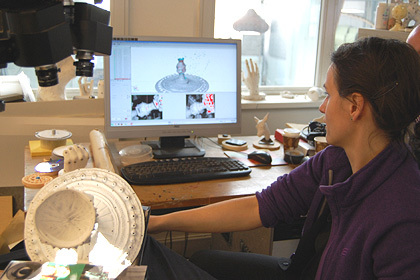 This required each student to have 3D computer files so I also offered a course in the use of the 3D modeling software Blender. As a free open source software package this is ideal to get started with. By the end of the week everybody had printed one or more forms and I left pleased with how much we had got done and how smoothly it had gone. These forms explore ideas I first worked on as digital drawings, to use computer code to simulate mutation and randomness. This series represents my interest in the natural code underlying organic growth. As with the making of stalactites or ant hills, these forms have an underling structure or logic and built into that is a randomness that creates a different form each time the code is run. In the Random Growth series I wants the viewer to bring their own subject interpretation to the form, trying to make sense of the shapes while allowing for a personal and imaginative reading of the object. The University of the West of England Centre for Fine Print research put up the question on their news page – Can Egyptian Paste Techniques be used for 3D printing. Having got a good Egyptian paste recipe that I have used in schools workshops I had to give it a go and it prints fine. Egyptian paste is a self-glazing low fire clay body. Glass forming soda is added to the clay and as the object dries (lower right) soda crystals grow on the surface. The soda then melt during the kiln firing to create a glaze. 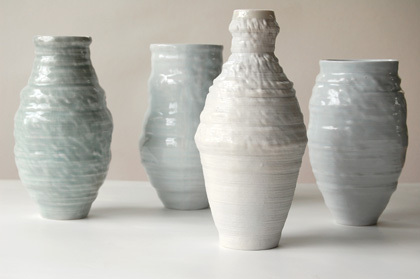 The turquoise colour comes from copper oxide that is also added to the clay. 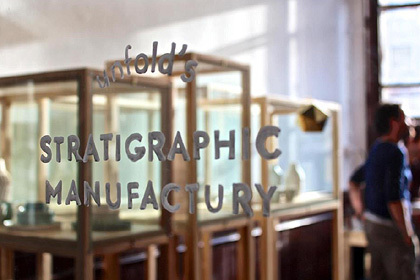 In May I spent a week at the Royal Institute of Art, Stockholm to participate in Print up. Print up is an artistic research project managed by Charlie Stern in collaboration with Esther Ericsson who is lecturer in charge of Free Form Fabrication, the 3D digital area of the Sculpture department. 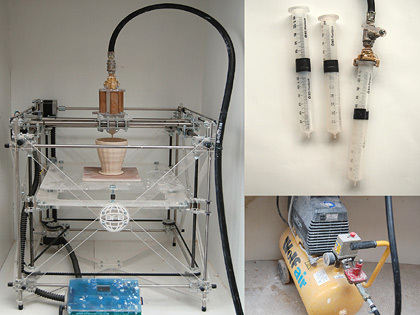 The research project is focusing on new developments in 3D printing with particular reference to two main areas, low cost DIY rapid prototyping and how established making processes can make use of 3D printing. These pots started out as computer code. A point is coded in virtual space to spiral, and as it grows into the pot shape a three dimensional computer mesh is created linking the points. The surface of the mesh is progressively textured by adding digital sound recording. The surface, from base to rim becomes a representation of the tone and rhythm of the music named in the title of the pot. This digital information is then printed out as a pot using the studio based DIY 3D printer that I have adapted to print with porcelain clay. This process is best described as ‘mechanical pottery coil building’, where a thin coil of clay is built up layer by layer. 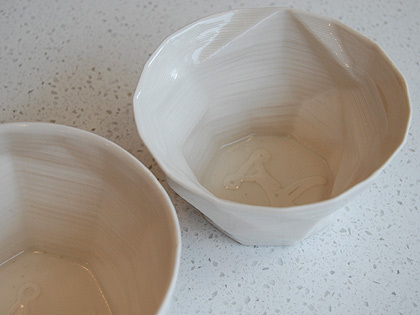 Once printed the ceramic is fired and glazed in the normal way. For more than ten years I have been aware of sculptor Bruce Gernand who has a studio in Norfolk just over an hour’s drive from me. But only now have I finally managed to visit him. It was a fascinating morning and intriguing just how much common ground there was between us. Bruce first came to my notice around 2002 because of work he was doing at the European Ceramic Work Centre in the Netherlands. 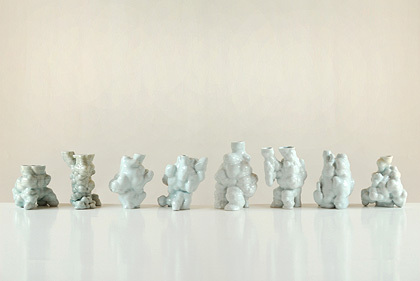 He was looking at the possibilities for computer aided manufacturing in clay for artist who often work in a more self-sufficient context, the lower end in comparison to industrial manufacturing. Like myself during this period we were exploring how practical it was to get the digital information out of the computer and into real space. Our home territory was the physical world of objects but much of what we were doing was informed if not generated by digital practice. It is a more recent project of Bruce’s that ensured I make the visit. 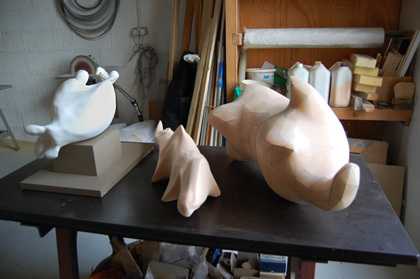 In 2007 I had contacted Bruce to find out if he knew of anywhere I could print 3D digital information directly into clay as there was a project around morphing of forms that I wanted to do. Bruce’s reply was no, but the morphology of forms sounded interesting as it was something he was working on. For Bruce this developed into the Coded Chimera, a collaborative project between himself the Natural History Museum and the Cambridge computer Lab. 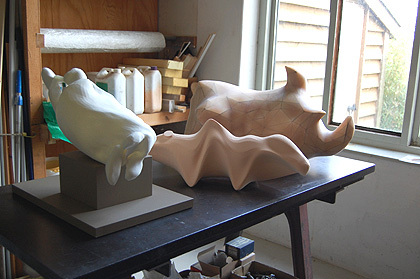 Our common interest in biological morphogenesis and the relation to sculptural form with reference to Darwinian theories of evolution and natural selection kept the conversation flowing. On growth and Form, a seminal work by biologist D’Arcy Wentworth Thomson not unsurprisingly came up in conversation. 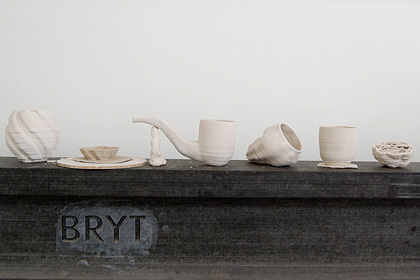 In recent talks I have used the idea of growth as an important theme in my working process. So it was interesting to hear Bruce talk about using computer modeling tools not so much to ‘construct’ as ‘grow’ forms. That for him the computer screen has become less of an abstract mathematical space and more of a nurturing, creative environment in which to work. 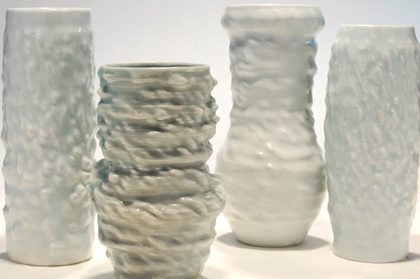 The above video represents a speeded up creation of a form from code to finished fired and glaze object. 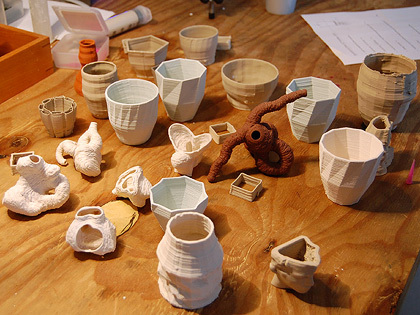 Why use 3D printing and what qualities do you think it offers over traditional processes? I use 3D printing as a way to realise forms that have been computer generated. I am particularly interested in form and the natural evolution of three dimensional shapes and how humans respond to it. 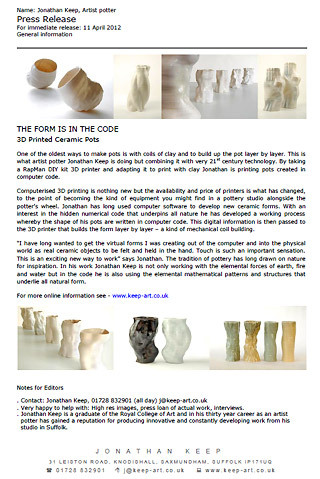 The patterns and systems that go into making natural forms can be explored in computer code and it is to realise this code as physical objects that I am using 3D printing. This is just not possible with traditional processes. 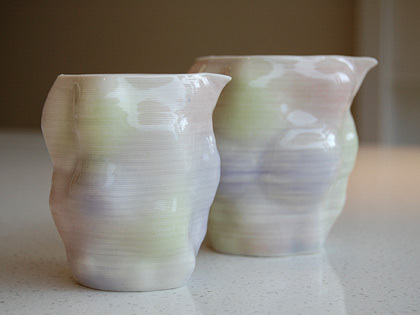 However the printing technique I use is very close to the traditional ceramic technique of coil built pottery – it could almost be seen as mechanical coiling process. Undoubtedly the ceramic skills I have and the knowledge of working with clay are vital in adapting the 3D printer for my aims. What printing offers is a new way of working that includes the computer as a tool that becomes much more integral to my way of creating forms. 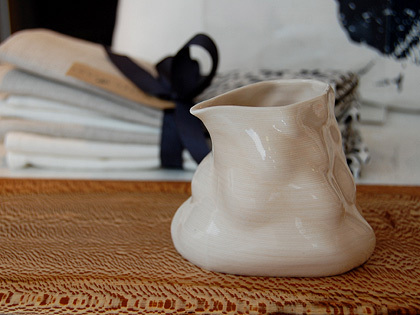 In the past I have used the potter’s wheel as a tool to give form to inert clay, now it is just another machine. What is important is the way you use these tools. The use of digital technology is important in my finished pots as for me the making process becomes implicit to the expression of the work and I want my pottery to be a reflection of the time in which I am working. That is not to say I am looking for a particularly ‘digital’ aesthetic. My subject is the natural world and how we are part of that natural system that can be visualised through computer code. 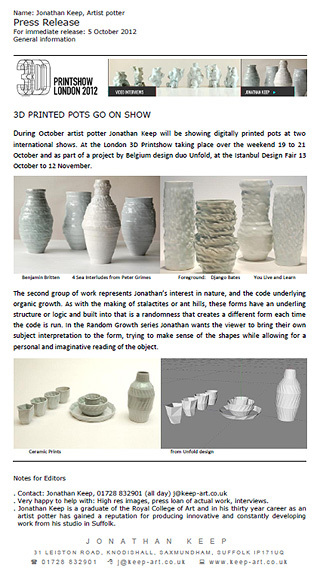 This series of pots begins with a cylinder defined in computer java code. I have written the code such that on each run of the code the cylinder is distorted by introducing randomness - what I think of as mutation. 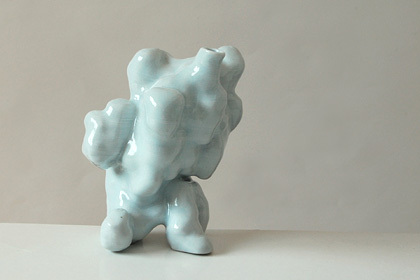 A distorted form is captured and setup to morph between the distorted form and the cylinder. A series of files are then produced representing the animation between these two extremes. Interested in how computer code can be used to simulate natural growth I have been using the open source toxiclibs voxel library written by Karsten Schmidt for Processing. In these forms a constantly mutating sphere is coded to grow from a central point, die after a random distance, return to the centre and grow again. 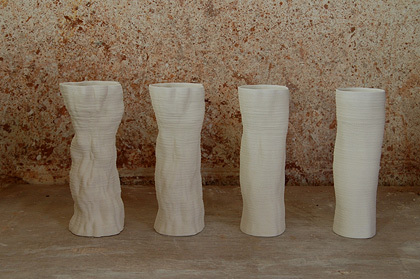 The two left hand pots are made as single prints using one cartridge – a double syringe of clay. To make bigger forms, as right the computer mesh is cut in half using the software Blender and then printed from two separate files. 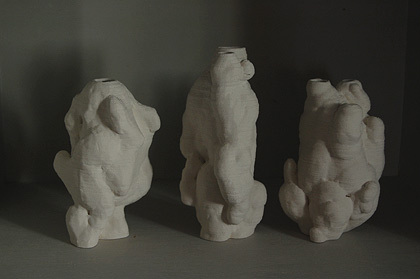 Once each print has stiffened enough to handle the forms are stuck together using conventional ceramic techniques. 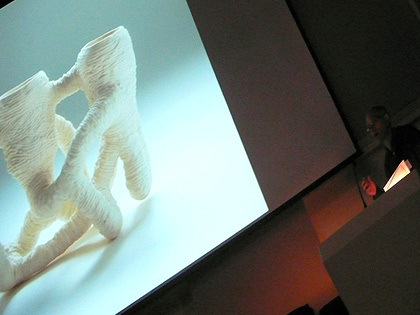 During the last discussion session of the Towards a New Ceramic Future Symposium at the V&A I was intrigued how the subject of a paradigm shift was raised from the floor. 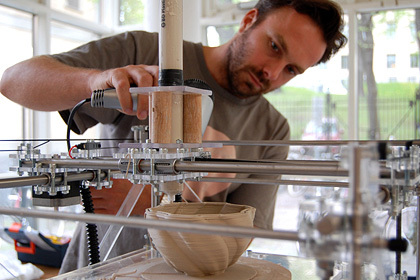 It was as much about the influence of digital tools on making as 3D printing specifically. In my experience there is certainly something going on, and digital tools undoubtedly offer new ways of working. But form me it will always be combined with traditional materials and techniques knowledge, it’s an evolving continuum. A point I should have made and this is about working in ceramics, is that I do think 3D printing - or whatever it comes to be called, now offers a new and fourth way of making in clay. In broad terms I have always thought of three approaches to working. Handbuilding, that includes pinching, coiling, slabbing and all its combinations. Secondly throwing on the potter’s wheel, and thirdly moulding in all its many forms. Printing is not moulding as there are no moulds to be made. There are elements of throwing but the process hugely extends the limitations. My printing process could be seen as mechanical coiling but I don't think you can call it handbuilding! 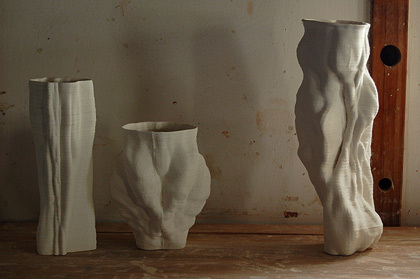 I am suggesting 3D printing in clay, and however it develops will become recognised as a fourth way of transforming formless clay into desired ceramic shapes. I was invited to do a presentation at this symposium that brought together leading exponents in the field of 3D printed ceramics to disseminate recent research findings, share knowledge, and to discuss scope for future developments. Following the success of last year's 'Pop Up' exhibition Roundhouse and Chalk Hill Contemporary Art have joined forces once again to show a selection of innovative Craft, made by six original artists who live and work in Britain. 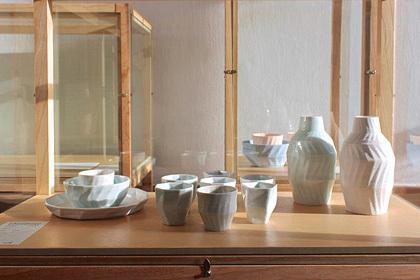 Curated by Annabel Agace, and coinciding with the summer show at Chalk Hill, the art gallery she runs in her modernist house, this interesting juxtaposition of work will inhabit the unusual setting of Roundhouse's kitchens & furniture showroom in the centre of Guildford. 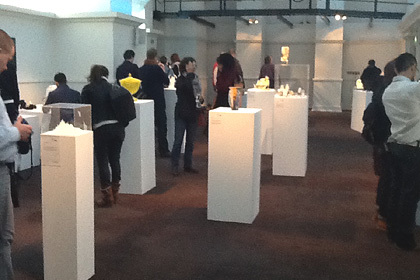 Both exhibitions enable visitors to see work in domestic environments. All work will be for sale. Full credit for the 3D ceramic printing technique I am using must go to the Belgium design studio Unfold. I had been making syringe forms by hand but it was Unfold who source the RapMan digital printer and refined the process of attaching a syringe to a 3D printer. 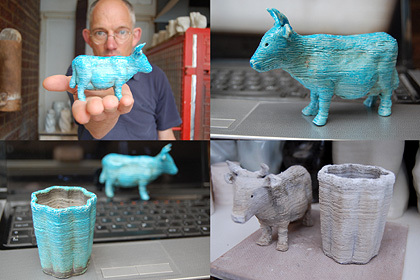 With a desire to continue Unfolds generosity in sharing knowledge I have post my early printing progress on the Unfold-fab blog in support of the pioneering developments they have made in ceramic 3D printing. Visit the blog link below to for more detailed information on the printing technique.